While running on the treadmill is great exercise, studies show there are several benefits of walking during the workday including a mental boost of creativity! As The New Yorker attests, some of the most brilliant literary and poetic minds in history nurtured a love for the ambling walk; getting on one’s feet has always seemed intrinsically linked to brainstorming, creativity, and the flow of ideas. But you may believe that there exists no demonstrable link between walking and creativity. Enter a study from Stanford University that positively correlates the movement of walking with a spike in creativity and brainstorming capabilities. For businesses that rely on ingenuity and creativity, it may be time to restructure office life and incorporate movement around the office to capitalize on the benefits of walking and the magic of brainstorming. Here’s how you can make the most of your workplace in light of this new study. The “ walking meeting” is already a staple in many companies. Walking meetings have many tangible benefits already: by moving to a relaxed setting and separating the team from the hierarchy of the meeting room table you can tear down the barrier between management and employees. In addition, walking stimulates the brain in ways that lead to increased recall after the meeting itself, and it gets the heart pumping and neurons firing so workers can more effectively brainstorm. When collaboratively coming up with a new concept or approach for your business you may find that walking meetings are a welcome change. Keeping workers cooped up at their desks all day will inevitably lead to burn out and reduced productivity. But how do you keep employees energized and operating at full capacity? Tell them to take a hike. No, don’t fire them – make them take breaks or lunch outside. Encourage a walk during breaks to activate their creative energies. Movement and exercise outdoors, even in increments as seemingly small as 5 minutes a day, has a great impact on a person’s mood and mental health, according to a University of Essex study. The Stanford University study expanded this and found that even walking indoors boosts creativity and wellbeing just by getting workers out of their normal environment. Of course, many activities in the office must be completed at a desk – it would be impractical to suggest that you can design a logo or fill out a spreadsheet on your desktop while walking around outside. 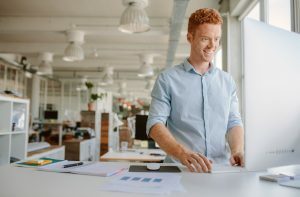 But by switching to a standing desk or treadmill desk you can engage your body in similar ways as if you were fitting in your daily cardio at the gym. With a standing desk all you need is a Wurf board to incorporate micro-movements into your day. While these movements can assist in brainstorming and creativity, they will also relax your muscles, thereby improving your posture and allowing you to focus more effectively on your work. Typical sitting desk present many health problems and don’t naturally encourage creativity. If you manage an office, hold a walking meeting and brainstorm ideas to incorporate movement into the office culture of your company. If you’re an employee, urge management to consider the positive benefits simply taking a walk can have on the ability of employees to have (and grow) big ideas. It may be as simple as putting a treadmill in the office or as off-the-wall as installing a racquetball court in the office building. Make it a priority to get workers on their feet to reach new heights in the workplace and reap these benefits of walking.